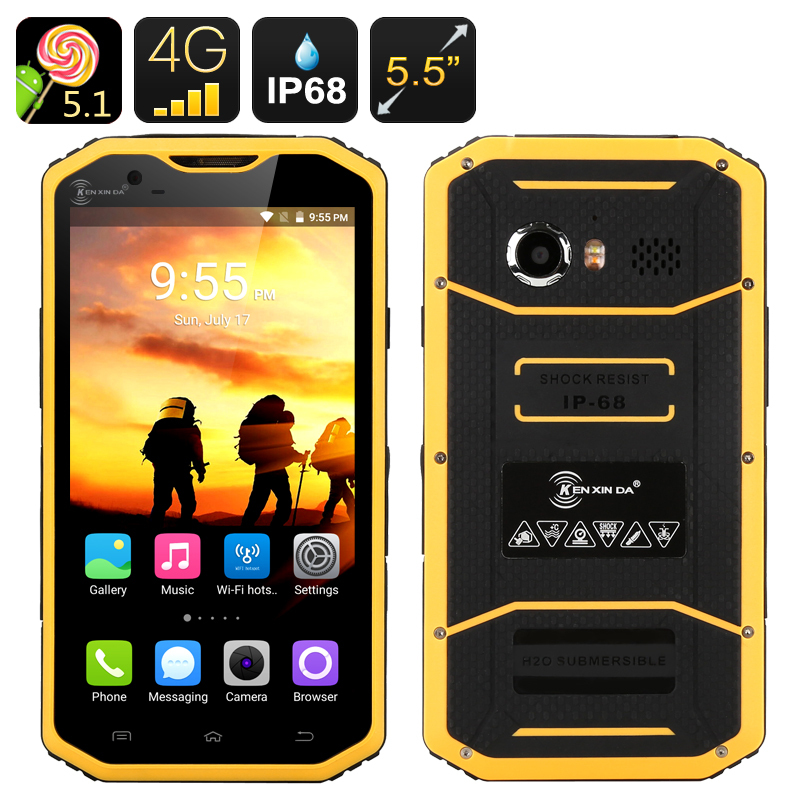 Successfully Added HK Warehouse KEN XIN DA PROOFINGS W8 Rugged Smartphone - IP68, Android 5.1, 5.5 Inch, Dual SIM, Octa Core CPU, 2GB RAM(Yellow) to your Shopping Cart. The Ken Xin Da Proofings W8 is a 5.5 inch rugged Smartphone brining triple protection from dust, water and drops so you can take it everywhere you go no matter how harsh the conditions. Sporting a 5.5 inch HD screen with this rugged cell phone delivers beautiful picture quality and its bright display makes it easy to view outside. With IP68 protection it is made to take pretty much all the abuse you can throw at it and still work. Whether submerged in water, buried in sand or knocked about this phone will be in its element and continue to deliver a great performance thanks to its Octa Core CPU and 2GB of RAM. This rugged Smartphone is able to support two micro SIM cards with 4G support, this means the Ken Xin Da W8 can take advantage of the best cellular data services around with lightening quick downloads at up to 150Mbps, handling high speed transfers for streaming movies and keeping in touch with the world couldn't be faster while on the go. This IP68 Smartphone can also handle multiple numbers simultaneously, making it easy to manage two numbers at the same time and providing easy management for all your work and social contacts. Having front and rear cameras with 5MP and 8MP resolutions the Ken Xin Da W8 can snap high qaulity portraits as well as great scenic shots and thanks to the built in LED flashlight you can even snap great shots in low light. With its 3000mAh battery and energy efficient Android 5.1 OS this rugged phone achieves up to 6 hours of usage time or around 120 hours in standby from a full charge, more than enough for a full day of action. The Ken Xin Da Proofings W8 Rugged Smartphone comes with a 12 months warranty, brought to you by the leader in electronic devices as well as wholesale Android Smartphone.